A woman who was once happy, positive and confident is now – 4 years later after falling in love with a narcissist – a shell of a woman who knows intellectually she needs to leave this relationship, but can’t seem to make her heart understand. When it comes to matters of the heart – even the ones that hurt – it’s not an intellectual conversation. When your son sees you being screamed at by his father – but your husband is good to your son and a good provider for the family – how do you just walk? For anyone who’s not emotionally entangled in that relationship, it’s all very clear. But that message hasn’t yet made its way to your heart. So you stay, get sucked back in, hope and believe that maybe someday…he’ll be happy. Maybe someday he’ll claim you, remain faithful, and become the man you believe he can be. Maybe someday he’ll look at you like he used to. The person who’s in that relationship has to take that journey for themselves from their head to their heart. We can attempt to tell them and reason with them, but that doesn’t mean they can hear us. They have to hear it for themselves, feel it for themselves, take that walk themselves. It doesn’t happen overnight; but it does happen. 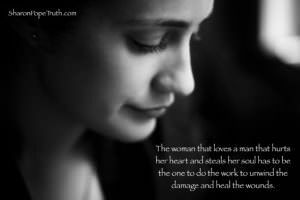 The woman that loves a man that hurts her heart and steals her soul has to be the one to do the work to unwind the damage and heal the wounds. She has to come back home to her own heart so she can hear and feel her own inner wisdom. She has to become strong enough that she can safely walk away. And she has to be aware enough to never get back into another relationship like that again. And that is her soul’s journey.